The Canon C300 has been around for sometime now and has proved itself to be a reliable workhorse. Ideal for interviews, it produces pleasant pictures with minimum fuss. As the older brother to the C300 II, it is limited to 1080p and it’s more limited dynamic range produces a few issues when confronted with large areas of a single colour, i.e. chromakey green. We therefore do not recommend it for green screen work. The Canon C300 is still a very viable camera for interviews and talking heads when you don’t need 4K. Its reduced price makes it good value for money and is still capable of producing a lovely picture quality. 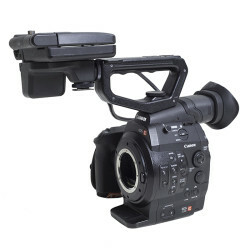 The EF-mount Canon C300 Camcorder Body with Dual Pixel CMOS AF features a Super 35mm sized CMOS sensor and broadcast quality 50 Mb/s 4:2:2 MPEG-2 codec. This version of the Canon c300 is upgraded to include a new continuous autofocus function for all Canon autofocus lenses, using Dual Pixel CMOS AF technology. This provides faster and more accurate autofocusing to assist users when operating with small crews. 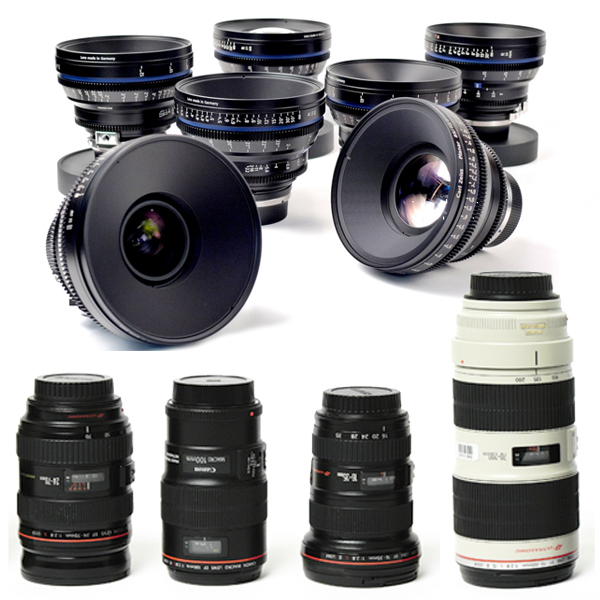 The EF lens mount on the Canon c300 offers compatibility not only with Canon’s existing broad range of DSLR lenses but also with their line of EF-mount CN-E cinema prime and zoom lenses. The Super 35mm sized sensor is paired with the Canon DIGIC III image processor, which uses an innovative method of breaking out red, green, and blue data to enable color performance on a level that would otherwise require three separate chips. The Canon c300 records up to Full HD resolution video to CompactFlash cards using the XF codec – at the highest level a 50 Mb/s, 4:2:2 MPEG-2 format, suitable for broadcast use. The Canon c300 Files are recorded using a MXF wrapper that brings together video, audio, metadata, and timecode in a package that is supported from all major professional NLE programs. For more flexibility to adjust your image during post production, the Canon c300 also offers Canon’s Log gamma mode, which results in excellent tonal reproduction in the highlight and lowlight regions of an image, and an expanded dynamic range. In terms of connections, the Canon c300 features HD-SDI output, timecode I/O, and genlock input BNCs. 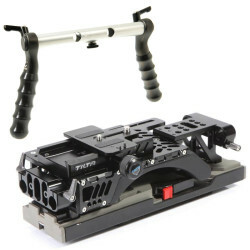 The body has a modular design that can either be stripped down completely, or be built up using the included handle, 4″ rotating LCD unit with full controls, grip, and thumb rest. This hardware upgrade provides an autofocus mode to help ensure sharp focus and smooth focus transitions. It provides a new Continuous AF (Autofocus) function for all autofocus lenses, using Dual Pixel CMOS AF technology. A new AF Lock setting also lets you change the Canon c300’s image framing while holding the desired focus. This feature is ideal for users who regularly shoot with smaller crews, who shoot moving subjects, or who want smoother, more natural-looking autofocus. The Canon c300’sDual Pixel CMOS AF technology features a CMOS sensor that consists of an array of pixels that each feature two separate photodiodes. By continuously comparing their outputs during AF mode, phase-difference autofocus helps ensure non-blurred images and smooth focus transitions even when the talent and/or camera are moving. The Canon c300’s new feature places a high priority on maintaining sharp focus while providing a natural, smooth autofocus movement with select Canon EF lenses – including newer-generation STM lenses – which offer even smoother and quieter operation. Modeled on the Super 35mm 3-perf motion picture film standard, the Canon c300’s CMOS sensor has an active image size of 24.4 x 13.5mm. It uses 3840 x 2160 photosites to perform the crucial optoelectronic transformation of digital imaging. Each photosite is a generous 6.4 x 6.4 micrometers in area, and each has a microlens that ensures the highest efficiency in light transfer to the individual photodiode. Proprietary technologies within the photosite simultaneously lower the image sensor noise floor while enhancing the photon capacity of the photodiode – a combination that assures the Canon c300’s superb dynamic range. The Canon c300’s image sensor employs an innovative readout technique that delivers full-bandwidth individual RGB video components without the need for any de-Bayering algorithms. Each of these components has a 1920 x 1080 sampling structure at up to 60 frames. From these original video components, a 1080-line 60i format or a 1280 x 720 at 60p HD format are selectively derived. The Canon c300 incorporates the first Canon CMOS sensor designed specifically for high-frame-rate motion pictures, offering not only high resolution and shallow depth of field but also high sensitivity with low noise. Working together, Canon c300’s Super 35mm sensor and DIGIC DV III Image Processor achieve a remarkably high signal-to-noise ratio that enables recordings with great detail and dynamic range even in minimal light. The Canon c300’s Log is a special nonlinear transfer function embodied within the DIGIC DV III RGB video processing system. This transfer function is specifically designed to facilitate the post-production of digital images originating in Cinema EOS in a manner similar to the post-production of images digitally transferred from motion picture film (the contemporary DI process). By managing the disposition of quantization bits, The Canon c300’s Log ensures excellent tonal reproduction within both highlight and low-light regions of a given digital image, maintaining a total dynamic range of 800%. These sophisticated video grading processes restructure a new digital representation achieving a sought-after creative look on a quality reference display. 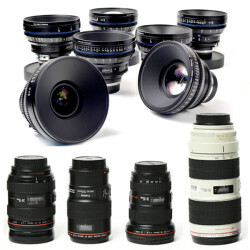 To integrate easily into the working style and equipment array of film crews and production houses, the Canon c300 with a Canon EF-lens mount is completely compatible with all of Canon’s EF lenses, including compact primes, super telephotos, specialty Tilt-Shift, Macro, and Fisheye lenses. When shooting with Canon EF optics that support Peripheral Illumination Correction, the EOS C300 can automatically compensate for the light fall-off or vignetting characteristics of each particular lens. Correction data specific to each lens model is loaded onto the camera’s firmware, with future lens data added through firmware updates. The combination of sensor and image processor renders an extraordinary signal-to-noise ratio and as such make shooting at high ISO (up to ISO 80,000) possible. The Canon c300 uses enhanced signal processing to minimize rolling shutter skews and to reduce moiré artifacts. A high-speed readout significantly reduces the subjective visibility of the vertical skewing on fast-moving horizontal subjects, a typical pitfall of the CMOS image sensor. Designed and built by Canon for the highest HD RGB processing, the DIGIC DV III Image Processor in the Canon c300 uses proprietary circuits and architecture to deliver the highest image quality at the highest speeds, with low power consumption and minimal heat output. It processes the RGB representations that originate in the single CMOS sensor of the Canon c300 into three channels (Red, Blue and Green) to maintain the rich resolution and clean color fidelity formerly possible only in three-chip sensor designs. To create digital files robust enough for major post-production, the Canon c300 delivers the highest image quality with its XF Codec – the same codec used by other Canon XF professional camcorders. With 4:2:2 color sampling, the codec helps minimize jagged edges between red and blue and ensures ample quality for chroma key compositing with green screens. The Canon c300’s logical layout of buttons and dials make operation simple. A lock switch turns off all controls except the recording button and function buttons. Small ridges between the buttons help prevent activating functions by mistake. A backlit display panel is great for low-light viewing. A tally lamp is clearly visible from the side or behind the camera. The Canon c300 body is compact and easily handheld at just over 3 lb. There is a bright 1.55 Megapixel electronic viewfinder, and the camera comes bundled with a removable combination 4″, 1.23 Megapixel monitor and control panel. 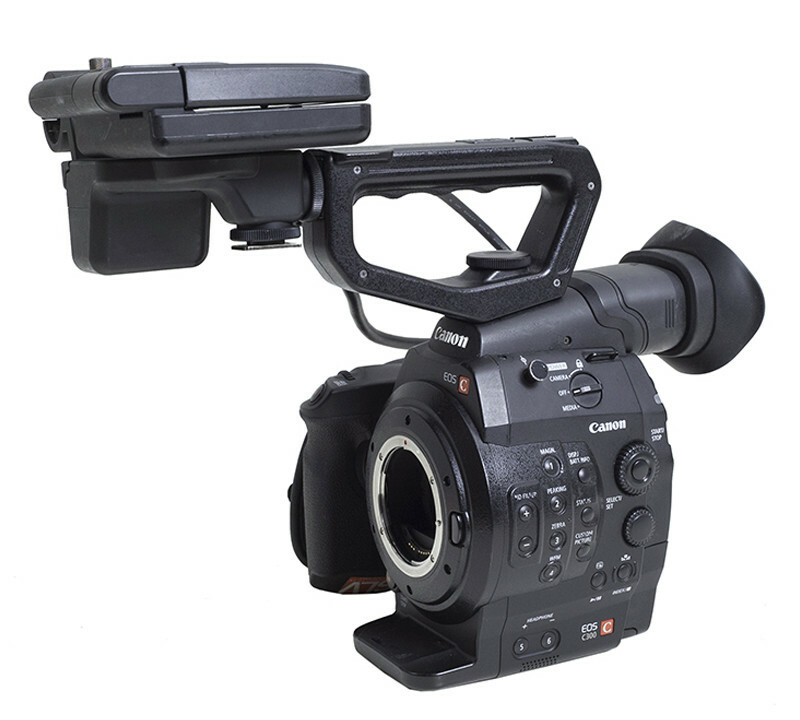 The Canon c300 also has a removable hand grip with a control dial and function buttons for handheld shooting in DSLR style. Or remove it and use the supplied thumb rest for completely stripped-down shooting. The Canon c300 has a manually operated built-in neutral density (ND) glass filter offering 1/4, 1/16, and 1/64th steps of filtering. Handheld or using a tripod, on location or in the studio, even on 3-D rigs, the Canon c300 fits shooting situations that are challenging for larger cameras. The Canon c300’s dust-proof and splash-proof design includes sealing gaskets around the edges of all access covers, dials fitted with o-rings on the axis of rotation, and button key-tops sealed with rubber. The Canon c300 also features a built-in silent cooling system with a heat-dissipating duct in the center of the body, a graphite sheet that conducts sensor heat towards the heat sink, three ventilation holes and a cooling fan that pulls hot air out through an exhaust opening. All air is directed through a discrete pathway that keeps dust particles away from sensitive components. Your camera runs cool, quiet, and clean. The detachable grip rotates 360° in 15-degree increments so the start/stop, iris control and multi-controller buttons are always literally at your fingertips. Four separate start/stop buttons and 15 other customizable buttons distributed over the Canon c300’s body mean quiet and intuitive access. Large dials positioned in two places can be customized for different functions and are easy to operate from all angles. The viewfinder tilts up to a convenient 60° angle. The 4″ control panel and 1.23 Megapixel monitor rotates 135° left/right or 270° down – and can be mounted directly on the camera body or the handle unit. Top, behind, from either side, on either shoulder: the Canon c300 operates from any angle. For situations where there is no second take and action shoots where things can happen with little warning, the Canon c300’s Pre Rec feature continually records approximately three seconds of full-motion imaging to buffer memory. When you press the record button, these seconds are automatically added to the shot – and you’ll have a welcome margin of insurance to capture the unexpected. The Canon c300 features a 0.52″, 1.55 Megapixel color EVF and approximately 100% field of view coverage for comfortable viewing and accurate judgment of composition, focus, and color. The angle of the viewfinder is adjustable for additional user comfort. EVF adjustments include brightness, contrast, color, and backlight (Normal or Bright). 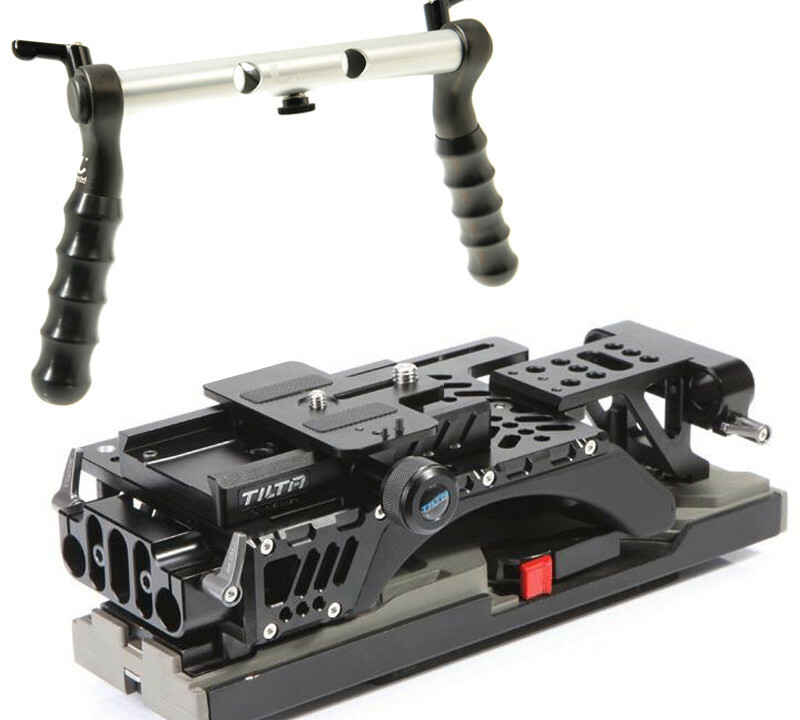 When mounted to the Canon c300 camera, the included control unit provides two XLR audio inputs with +48V phantom power. A 3.5mm microphone terminal is also built in to the camera. Audio is recorded uncompressed in 16-bit PCM format at 48 kHz for high fidelity sound. Both XLR inputs, as well as the mic terminal have the option for automatic, as well as full manual gain control (-Infinity to +18dB). Additionally, a 3.5mm headphone terminal with 16 volume settings offers accurate audio monitoring. The Cinema EOS system creates files in the internationally standardized Material eXchange Format (MXF), wrapping video and audio with metadata in a single file that maintains access to critical information throughout the production process. The Canon c300 records to inexpensive and easy-to-find CF cards in dual card slots, giving you unlimited hot-swappable storage on reliable solid-state media. And for industry-standard peripherals, the EOS C300 has all the right terminals: remote (2.5mm), sync out (BNC), HDMI type A out, genlock (BNC), timecode (BNC), HD/SDI (BNC), headphone, SD card, DC input socket, plus mic and XLR connectors (CH1 & CH2) when using the included Canon monitor/controller unit. The camera also includes a dedicated connection port for the optional Canon Wireless File Transfer WFT-E6A unit. Video shot in Canon Log gamma can be easily converted to industry-standard 10-bit Cineon (.cin) Log format, which assures smooth integration with industry-standard post workflow and finishing. The EOS C300’s 24p mode matches the frame rate of film cameras, so there’s no need for time-consuming frame-rate conversion. And you’ll have plug-ins for leading NLE systems from Adobe, Apple, Avid, and Grass Valley. Whether your entire production is digital or your Canon c300 is used as an A, B, or C camera on a primarily film-based shoot, the integrity of your image and sound is assured through the editing process – and beyond. To achieve the look and feel you want in less time during post-production, the EOS C300 has 23 different Custom Picture settings. Custom Pictures can include different image-quality adjustments, including gamma, knee, color matrix, sharpness, noise reduction, and more. Settings can be created in-camera and saved to the Canon c300 or to an SD card for transfer to other cameras. A total of 9 custom picture profiles can be saved in the camera, and up to 20 can be saved to an SD card. A number of natural color settings are included with the Canon c300; others include Cinema setting for post-production and EOS setting to match images captured by a Canon c300 DSLR. In ambient conditions that cause the black in the video signal to shift out of alignment, the Canon c300’s black balance can be easily adjusted to bring it back. A simple process with the lens cap on the camera, black balance adjustment is especially useful the first time you use the Canon c300, when your camera has been on the shelf for an extended period, when you’ll be shooting in a wide range of temperatures, or when the ISO sensitivity or gain settings have been changed. With the realities of production in mind, the Canon c300 can record in a number of different modes, resolutions and frame rates, delivering quality recordings perfect for any application. 24p mode matches the frame rate of film cameras, so there’s no need for time-consuming frame-rate conversion. And the camera can shoot in both PAL and NTSC modes at 50 Mb/s (CBR), 35 Mb/s (VBR), and 25 Mb/s (CBR) with a range of settings for resolution, color, frame rate, and recording time. Beyond the advantages of file-based recording, the EOS C300 offers a number of creative possibilities in post-production. By capturing fewer frames per second, the camera can transform normal action into intense high-speed motion up to 60x. By capturing more frames per second, the camera can slow down motion to 1/2.5x at 720p. The Canon c300 can also be programmed to record a set number of frames at defined intervals for amazing time-lapse photography – and a frame-recording feature is ideal for stop-frame animation. To connect to external monitors, switchers, VTRs, and NLE systems with SDI inputs, the EOS C300 features industry-standard HD-SDI output, genlock, and timecode terminals, plus audio terminals with Linear PCM recording. Timecode and genlock enable synchronized multiple camera capture, perfect for multiple-camera shots, 3D acquisition, and more. The HD-SDI sync terminal can be switched to output to HD Sync, HD Y, Black Burst, and Composite. The camera has a Waveform Monitor (WFM) function that shows the overall brightness of a scene, with RGB Parade Display to view red, green, and blue brightness or Spot Display to isolate the luminance distribution of a chosen area. The Vectorscope (VS) display shows real-time hue and saturation levels. For sharp focus, the Canon c300 camera has two peaking modes and a magnified focus assist function. An Edge Monitor Focus Assist provides both a waveform representing the overall degree of focus and a red waveform that represents focus in three specific areas displayed on the camera’s 4″ LCD monitor. To maintain proper highlight exposure, it offers a zebra bar feature as well. Offering a new level of mobility, the optional Canon Wireless File Transmitter WFT-E6A opens up a world of wireless options to the EOS filmmaker. The Canon c300 camera comes preconfigured so that the Canon c300 settings can be viewed and controlled on third-party devices with web browsers, including computers, smartphones and tablets without the need for additional in-camera software. With the WFT-E6A module, the Canon c300 can be controlled from up to 150′ away over an 802.11a/b/g/n wireless network. The WFT-E6A enables superior camera control: users can start and stop recording; adjust focus, white balance, gain, and other parameters; and adjust the aperture of Canon EF lenses. This offers huge potential for specialty applications where the Canon c300 must be controlled remotely such as nature documentaries or reality TV. It also enables input marking for metadata and offers a live view of the composition. It supports incorporating GPS information into the file metadata, which is useful for general cinematic applications and essential for expedition filmmakers. A basic window mode even enables use with the Apple iPhone, iPod Touch, and iPad, as well as with handheld devices employing the Android operating system.